Interceptor designed to counter U.S. bombing raids on the Japanese islands. Only two prototypes were finished before the end of the war. 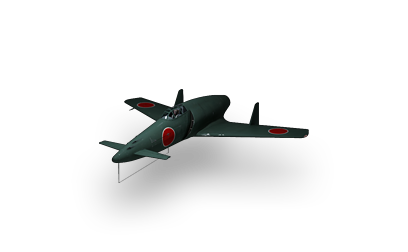 The "J-" designation of J7W1 referred to land-based fighters of the IJN and the "-W-" to Watanabe Tekkōjo, the company that oversaw the initial design; Watanabe changed its name in 1943 to Kyūshū Hikōki K.K. The feasibility of the canard design was proven by both the powered and unpowered versions of the MXY6 by the end of 1943, and the Navy were so impressed by the flight testing, they instructed the Kyushu Aircraft Company to design a canard interceptor around Tsuruno's concept. Kyushu was chosen because both its design team and production facilities were relatively unburdened, and Tsuruno was chosen to lead a team from the First Naval Air Technical Arsenal to aid Kyushu's design works. The production of J7W was canceled due to the end of World War II. The type never saw combat.